Did Dolphins Really Save A Girl From Drowning? According to one researcher, dolphins intentionally led a group of scientists to rescue a suicidal girl in the ocean near Los Angeles. Could that really be true? Last week, Ocean Conservation Society President Maddalena Bearzi published an article in National Geographic Newswatch, adapted from her book, on a moving experience she had while conducting dolphin research one day off the coast of Los Angeles. "Someone's in the water!" yelled my assistant, standing up and pointing at the seemingly lifeless body of a girl. For a moment, we were silent. Then, slowly, I maneuvered the boat closer. The girl was pallid and blonde and appeared to be fully clothed. As the boat neared, she feebly turned her head toward us, half-raising her hand as a weak sign for help. I cut the engine and called the lifeguards on the VHF radio. They told us not to do anything until they arrived on site but it was our unanimous feeling that if we didn't act immediately, the girl would die. We decided to ignore lifeguard's instructions, instead pulling the frail and hypothermic body on board. I called the lifeguards back and informed them that she was alive and that we had her aboard and we were heading back to Marina del Rey, the closest harbor, as quickly as possible. As Kathleen Dudzinski, my research supervisor at the Dolphin Communication Project, used to say: 'You never hear from the people that the dolphins didn't save.' It might well be that some dolphins are pathologically indifferent to our fate, leaving us to drown when they could have easily saved our lives. Although the idea of killer-dolphins sounds ridiculous, the world has seen stranger things. One news item from 2012 tells the tale of a fisherman lost at sea in the Pacific who was led to safety not by a dolphin, but by a shark. He was lucky that friendly dolphins did not show up to drive the friendly shark away, or he might never have been heard from again. They might have simply been swimming over to figure out what all the commotion was about. Or they might have known that the girl was in trouble and were planning to help her. Or they might have been guiding the researchers to the girl. Or, although it seems unlikely, they might have been completely uninterested in the girl and were investigating some fish that were gathered nearby. Without unambiguous data – like video and audio recordings of their behavior before, during, and after the event – it is difficult to make inferences. And even with video data, trying to interpret dolphin behavior to reveal what they are thinking/intending is extremely difficult. But is it at least conceivable that the dolphins were intentionally guiding the researchers to the girl? Gregg says, "Some experiments have shown that dolphins do direct the attention of humans toward an object or event of interest – by pointing with their bodies and rostrum. 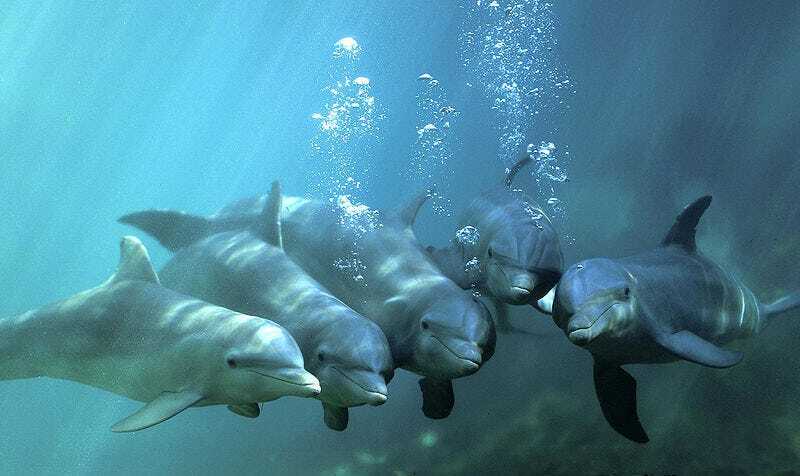 And there is plenty of evidence of dolphins providing aid to other sick and injured dolphins. So it's not a completely far-fetched idea to think that they could have directed the researchers to the drowning girl." And yet it is also possible "that the dolphins became aware of the drowning girl and took off to investigate, completely unaware of and uninterested in the researchers in the boat." It's a compelling story, but based on the available data we can't really say all that much about the mental mechanics of those Santa Monica Bay bottlenose dolphins. "It is possible - as a scientist - to suggest that the hypothesis that dolphins rescue drowning humans is an entirely reasonable one," Gregg says, "while also admitting that the evidence of them doing so is shaky."